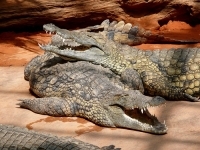 This Crocodile Park is home to more than 300 crocodiles and alligators from all over the world. Visitors shouldn't miss the crocodiles' feeding times, which occur daily at about 12pm, 2pm and 4.15pm, during which the animals are at their most active. The other half of the park is a zoo, which houses other reptiles, various birds, monkeys, chimpanzees, tigers, jaguars, camels and much more. There is a restaurant in the centre of the park where visitors can see a show where parrots perform various tricks, including doing a jigsaw puzzle and roller skating! The crocodile shows are, of course, the main attraction and are very educational, allowing audience members to touch baby crocs, among other things. The park is near the town of Aguímes, a few miles southwest of the airport. Those with a soft spot for reptiles should also consider visiting Reptilandia, situated a little off the beaten track, near Agaete, in the northwest of the island. This park houses a collection of snakes, tortoises, turtles and lizards. The Komodo Dragon here is believed to be the largest lizard in the world. There are also sections on spiders and monkeys. Kids are bound to love both attractions, and they are good options for families wanting a short break from the beach.